​I came across a fly pattern a while back that I hadn’t seen for some time and it got me wondering. How many fly patterns have dipped below the radar because of new arrivals and new materials? I mean those patterns used to work and would be instrumental for many a caught trout or fish so why are they not around today? Easy answer flies are set to catch the fishing anglers and not the fish. When working in the tackle shop we would see arrivals of thousands of new different patterns and the fly fishing anglers coming in to purchase would have their favorites among them. However you always had the twinkle in their eye looking at the new patterns and wondering if they would work. The answer is yes probably as feeding fish will attack anything really if they thinks its food. As these new patterns arrived in the store the older ones were phased out or not tied by the suppliers anymore and it was only the old die hard anglers who would even look for some of them. When we did get requests we could always rustle up a few flies for them as there were plenty of good fly tyers around and if not I could step up the vice if needed. Well anyway here is a bit of info an an old pattern originally tied by John Wadham of Rutland fame where I believe he still resides as secretary. The Poodle was originally tied for rainbow trout feeding off shrimps and seems to work well. The pattern is best fished on the point position with a small spider or buzzer to keep it company nothing else. Ideally its best used at the start of the season when the water is still cold and on a blustery day. The fly is meant to cast a shadow or solid silhouette for feeding fish who just can’t seem to ignore it. Casting requires a decent effort to get it out across the wind into the choppy water and then let the wind carry the line around in an arc. Make sure to keep in touch with your flies by gentle retrieving but not so much to induce movement in the fly. You want the wind to move the pattern not your actions. Its a basically cast and wait technique which requires a lot of patience something I am not very good at. Once the fly line has passed around with the wind slowly retrieve the whole lot back again. You need to have bit of space for this technique as you don’t want to offend other anglers as your cast swings around under their noses. The great thing about this pattern and the Ace of Spade which works equally as well is the fact of its neutral density and it will act as an anchor for the leader and other fly pattern. The thing about bank fishing is you need to keep on the move if one bay is not working then move to the next. It always amazes me that anglers will keep going back to the same spot the known, “hot spot”, as they know fish are caught there. 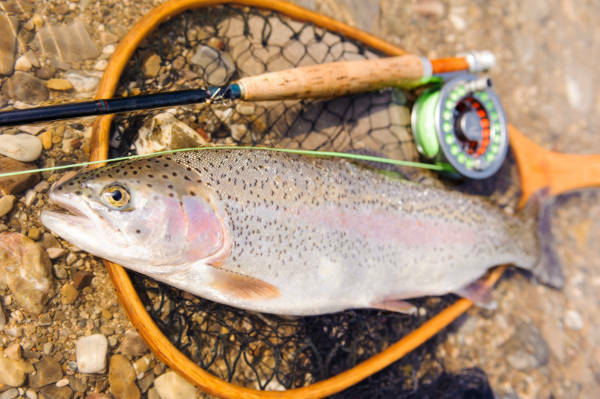 However trout especially in a lough or lake will move about the water in search of food and you could wait an awfully long time before they swim back around past you again. Counter Balance: As the wing is fairly bulky a bit of lead on the under side of the hook is required to allow the fly to swim upright. Wing: 3-6 successive plumes of black marabou separated by a turn of body material. Overall a great fly to start the season on when there is chop on the water and the water has been stirred up a bit so its not clear. The shadow of the Poodle should induce takes.